David Brooks is a columnist for The New York Times and frequent broadcaster. His previous books include the bestsellers The Social Animal and Bobos in Paradise. His New York Times columns reach over 800,000 readers across the globe. 4.0 颗星，最多 5 颗星A qualitative review of character that emphasizes the Christian ethic. I’m a student of moral development, so the idea that a scholar devoted himself to the root of character development pulled me into this book. I was grateful for the multiple vignettes on various men and women who found themselves on their path to maturity and ultimately character. It was difficult to follow the theme at times, but that was part of the charm of this book — I found myself getting immersed in each real-life story. The author returns often to the Protestant ethic...one that believes we are inherently flawed and cannot be made whole on our own. I share this ethic, but I was disappointed how forceful the author was at pointing it out (too often). It would have been more effective to allow the reader to arrive at these concepts on his/her own. 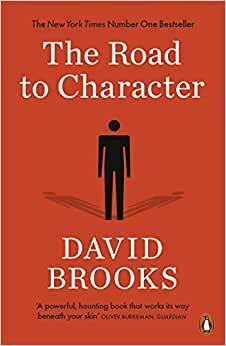 The last chapter effectively summarizes the author’s intent, that pride is the root of all that undermines character, and humility is the root of the development of it. To be brief about this, The Road to Character should be required reading and, perhaps more importantly, discussion throughout the 50 States. He begins by asking the interesting question of whether the individual wants to be remembered as his/her "Resume" or "Eulogy". Do we lead our lives fueled by a desire to establish a resume of success or to be remembered by others in a eulogy. He presents this approach by referring to Adam 1 (Resume of significance) and Adam 2 (Eulogy of a life well spent). Mr. Brooks understands that we human beings are complicated animals and that we are all fallible and subject to the lesser instincts of life. But he also understands that we have the ability to understand ourselves - to look inward and recognize those weaknesses - to become part of a greater good than the self. He chooses as multiple topics of conversation, a number of significant individuals in our history and he analyzes how these very different people dealt with themselves. We all, everyone of us, need to understand that heroism comes in many forms and one need not be - cannot be - without flaw. The trick is to understand oneself and view our roles as parts of the jigsaw of life where we can all play a part. "Character" means knowing ourselves and remaining loyal to our nobler aspirations despite those flaws. I read Brooks's columns in The New York Times sometimes and watch his Friday's weekly review with Mark Shields on PBS, so I had some idea of his 'style' before I made the purchase of this book. I wouldn't say it's fast-reading and enjoy the people that he selected. I can tell the author spent a lot of time researching all the biographical info, and the stories are fun to read, sometimes painful though. Very often do I sense that Brooks took over the 'voice' of the person he intended to write about and he kept it consistent, so that the reader can feel that this is all the same person. Insightful and thought-provoking for sure. Worth the reading for anyone above high school age. Truly amazing book. I have bought extra copies for people and have recommended it to even more. He brings to light the difference between the culture we live in and the attributes that make life truly meaningful by highlighting our focus on resume virtues vs. the eulogy virtues. This book makes you want to go out and tell the world our culture is going the wrong direction. We need to be teaching our children there is more to life than making money, it's about developing a good character.